Tests in pilot plants are essential for new product developments as well as for ongoing quality monitoring of production. 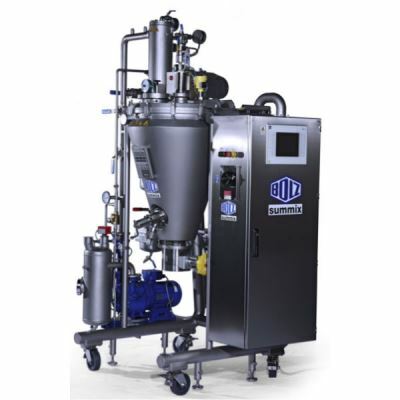 Each customer, each application and each product has slightly different requirements for this pilot dryer. The implementation of all these requirements is our task, which means that planning ultimately leads to a custom-made machine composed of standard units, specially designed and built to meet the customer's technical requirements. Our many years of experience in the construction of pilot plants also qualifies us to give detailed advice in the selection or preselection of corresponding production machinery. The possible applications are very varied and include the pharmaceutical and fine chemistry sectors, the composition of new food products and nuclear technology. This flexibly structured, frequently mobile but nevertheless ready-made multiple-purpose systems can simulate and execute a wide range of processes with high levels of accuracy and low energy consumption, while treating the product gently. Mixing, drying, kneading, humidifying, venting, granulating, etc. in a vacuum or under pressure, with or without heating. By using a suitable scale-up approach, drying processes can be reliably transferred from very small to very large volumes. 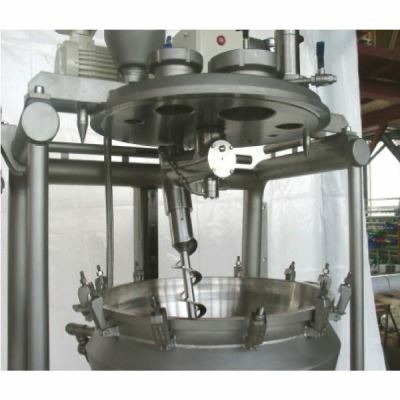 The systematic mixing process used by the conical mixer can be easily transferred from a pilot scale to a subsequent production process. 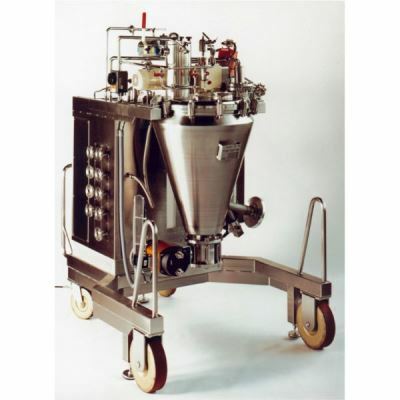 Our mobile pilot mixers and dryers are suitable for processing volumes ranging from 10 ml to 175 litres, can be transported without problems and offer the same comprehensive range of functions and equipment as our production-scale conical mixers and dryers. Infinitely adjustable drive, fully closed system with dust filter, heating and cooling system, vacuum stand with combined solvent recycling, as well as a local switch box and control panel are part of the standard equipment. Easy cleaning using a closed system with a retractable conical part for maintenance and inspection purposes. All components are permanently installed in a compact, mobile stainless steel frame. In many cases the transport and handling of the trial goods constitutes a problem, which is why we can offer you a pilot plant for test purposes. With the help and advice of a test engineer, we - and of course you - will carry out individual tests or comprehensive series of tests on your premises, thus acquiring a substantial knowledge of the product characteristics that can be used for detailed planning of any new system you might wish to have. Trials using our own facilities can also be arranged in consultation with us. All data obtained during the trial may be important; this is why all process parameters such as pressure or vacuum, product temperature, speeds, energy consumption, heating temperature, condensate temperature or product data such as current humidity and condensate volume are recorded and documented in a test protocol. The changing product characteristics, behavioural changes and other visual observations such as dust development are also noted. Irrespective of whether your are using your own or a rented pilot plant, you will be able to obtain detailed information and test results, on the basis of which we will be able to compile a comprehensive scale-up recommendation for the economic design of a production facility. The product quality and throughput can be maximised on the basis of such tests, optimal processing parameters can be defined and tested, predictions about time schedules can be made, mixing times are recorded, heat transfer is calculated and mechanical loads are quantified. Empirically speaking, the behaviour of your products under mechanical load and during thermal drying cannot be predicted, but our tests can give you certainty. This is how we normally manage to prevent unpleasant surprises. Add-on parts: Filter with cleaning facility, injection flange, sampling facility, inspection window with lamp, vacuum system with condenser, heating and cooling system and much more.